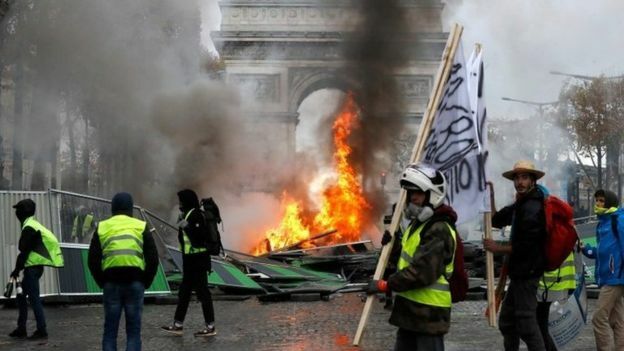 French President Emmanuel Macron will hold an emergency meeting of senior ministers on Sunday following the worst unrest Paris has seen in decades on Saturday. 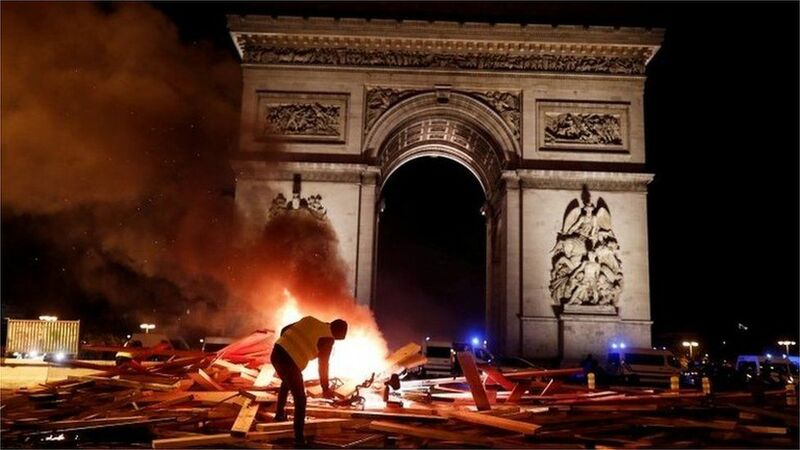 Government spokesman Benjamin Griveaux told France’s Europe 1 radio that a state of emergency may be imposed to prevent “serious outbursts of violence” after thousands of masked “Yellow Vest” protesters fought with police, and set fires to cars, houses and banks in the worst disturbances France’s capital has seen since 1968, when Macron’s wife was fifteen – the same age the French president was when they met. 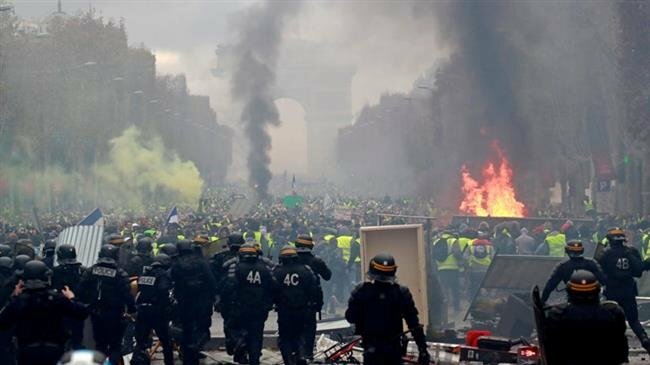 Griveaux had indicated the Macron administration was considering imposing a state of emergency. The president was open to dialogue, he said, but would not reverse policy reforms. On Saturday riot police were overwhelmed as protesters embarked on their destructive crime spree. Macron, meanwhile, denied that a state of emergency had been disccussed. Instead, Macron ordered his interior minister on Sunday to hold talks with political leaders and demonstrators, according to Reuters. 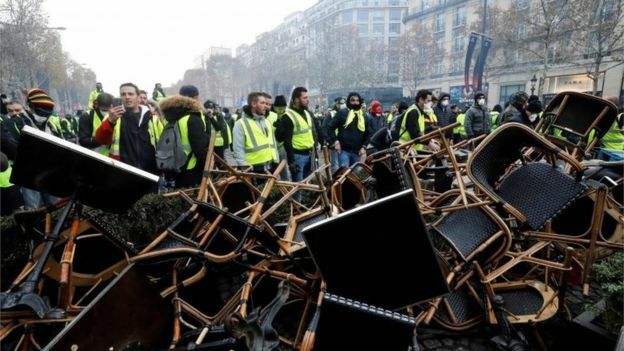 Griveaux said that around 1,000 and 1,500 protesters joined Saturday’s demonstrations “only to fight with the police, to break and loot,” and that the violent element “have nothing to do with the yellow vests” (aside from wearing yellow vests?). 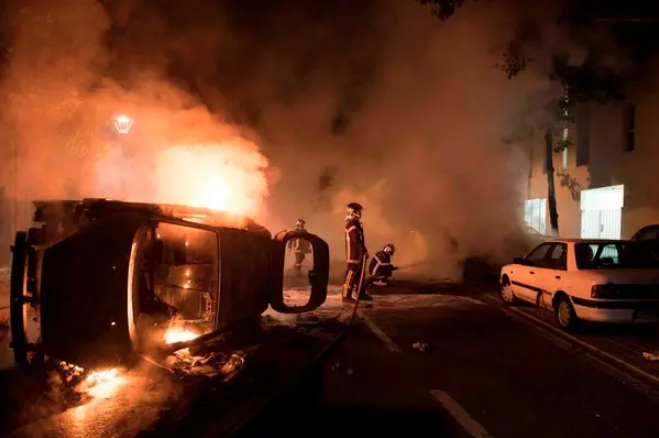 Demonstrators on Saturday were filmed destroing a police van and other vehicles, while other videos showed burning cars and police firing some 10,000 tear gas canisters as well as stun grenades to break up the protests. 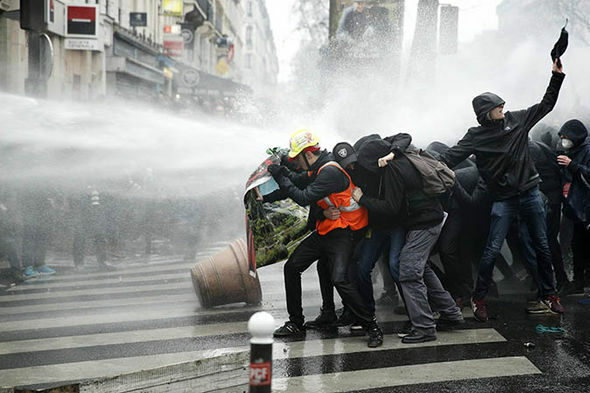 Macron says the fuel hikes are necessary to combat climate change – a move which has tappped into the deep dissatisfaction toward his many liberal reforms which many French voters feel favor big business and the wealthy. Macron’s plight illustrates a conundrum: How do political leaders’ introduce policies that will do long-term good for the environment without inflicting extra costs on voters that may damage their chances of re-election? His unyielding response has exposed him to charges of being out of touch with common folk outside of France’s big cities who worry about the squeeze on household budgets and job security. As Sliman notes, Macron can either cave to the protesters and face criticism by his opponents, or he can put down the dissent by force. 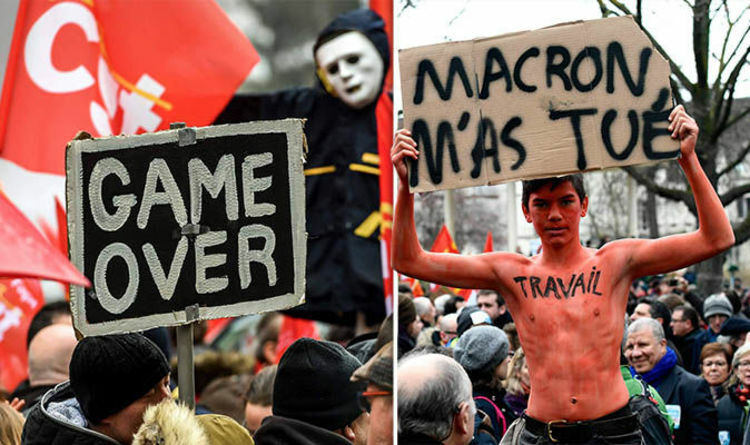 “In the second scenario, Macron will still come out loser, because what everyone will remember is that he wrestled with the popular classes. He would be victorious, but at the cost of having crushed them,” Sliman said. 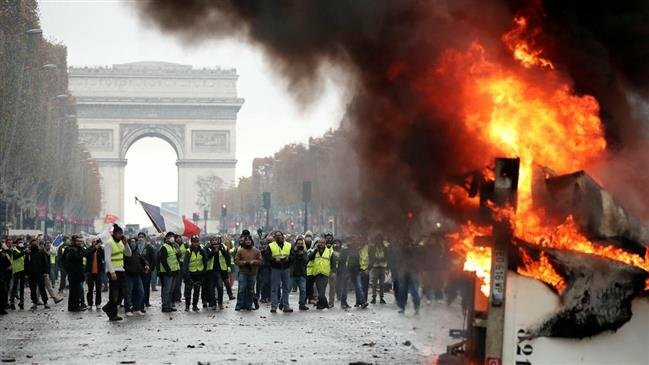 Macron was flanked by heavy security on Champs Elysees boulevard before heading into Sunday’s meeting, as bystanders both cheered and jeered him – with many calling for his resignation. 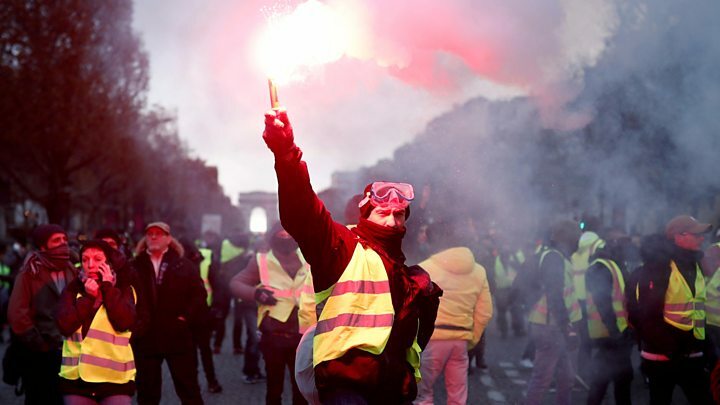 The reported size of the protest has varied between 36,000 and 75,000 yellow vests, while last week saw over 110,000 protesters at the Champs-Elysées in central Paris. 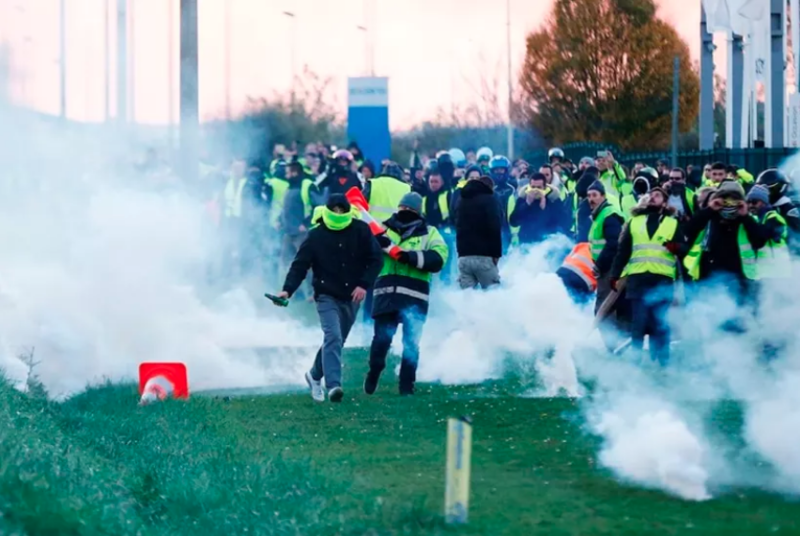 Over 400 arrests were made and 113 injured in Saturday’s unrest which began on November 17 over a hike in diesel taxes, but has grown to a general protest of Macron and his government. Macron’s popularity rating has plummeted to just 26%, while opinion polls for the 2019 parliament elections predict that right-wing Marine Le Pen’s Nationall Rally party will be level – or far ahead – from Macron’s La République En Marche.